Let me introduce you to a lovely young lady that I think the world of, Ava Penkilo. I have had the pleasure of working with Ava for some time now and can honestly say that to know Ava is to love Ava. She is an exceptionally kind girl and a very hard worker. Not everything has come easy to Ava, but she and her mom are a testimony to what is possible with the right plan and the dedication to follow through. Ava has made good progress in many areas since coming to NACD, but the thing I want to brag about today is how Ava has grown in the areas of maturity and confidence through cooking. Over the years Ava has shared what she is learning in the kitchen with me. More than once she has gifted me with a special treat she has made when she comes to her evaluation. Along the way we started sharing favorite recipes and have had conversations about tools and techniques. At one evaluation she gave me a copy of one of her favorite cookbooks and another time an apron that she liked the design of. When a dear friend of mine recently published a cookbook, the first person I thought of was Ava, so I picked one up for her. This particular cookbook is not meant for beginners, and I was so proud of Ava when I started seeing pictures of her making “Creamy Ricotta Pancakes with Blueberry Basil Syrup” and “Cherry Pecan Scones with White Chocolate Glaze.” These were very complex recipes, and Ava did a fabulous job of both making them and presenting them. I have asked her mother, Monica, to share how cooking has had such a positive impact in Ava’s life. I recall a time about 6 years ago when a friend was visiting our home. Ava started to feel hungry and asked if she could make lunch. She made a peanut butter and jelly sandwich, and my friend could not believe it. She said her big kids could not do that. Ava smiled with pride. Many years ago I let go of my fear of Ava hurting herself in the kitchen, and thankfully Ava has never had to go to the emergency room. One of her favorite Christmas gifts was a chef knife. “I want to help. Please let me chop the peppers. I’ll use my knife.” It is music to my ears hearing Ava verbally communicate with me in the kitchen. 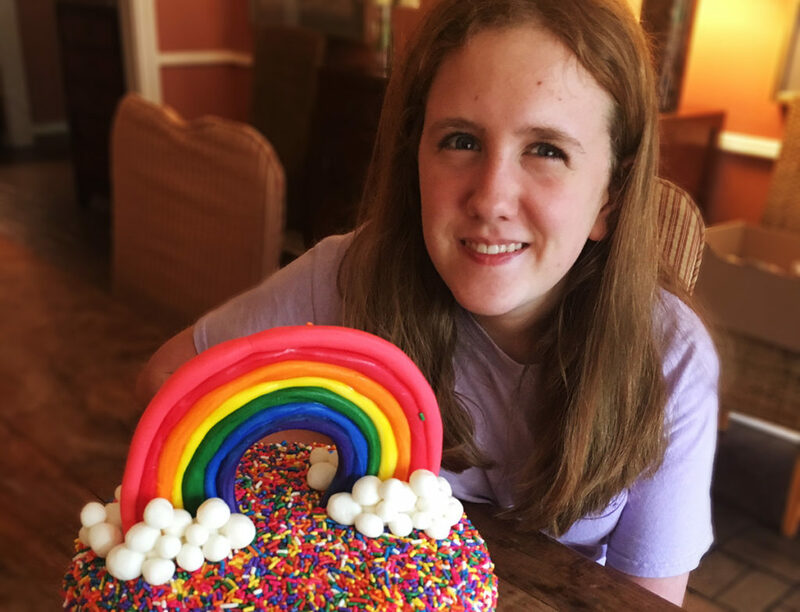 Although Ava has struggled with developmental delays since birth, she shines bright in the kitchen where she seems to find peace and calmness. The kitchen is a source of learning, nurturing, increased fine motor skills, and confidence building for Ava. Ava’s self-esteem has blossomed in the kitchen. She learns by reading recipes, measuring and using math calculations in cooking, writing grocery lists, and following a budget at the grocery store. Chopping, slicing, stirring, pouring, and mixing provide endless fine motor activities. The occasional mistake, like forgetting a stick of butter in the cookies, turns into growing opportunities. And there are lots of high fives, words of affirmation, and happy people after eating Ava’s delicious food. Ava loves baking with her sister and friends. It is one of the perfect social opportunities for her. They have baked themed cakes such as animal cakes, had cupcake wars, tea parties and cookie decorating fun. Ava connects with people in the kitchen and can often teach them something new. Ava recently had her first official birthday cake order for one of our friends who wanted a rainbow cake. 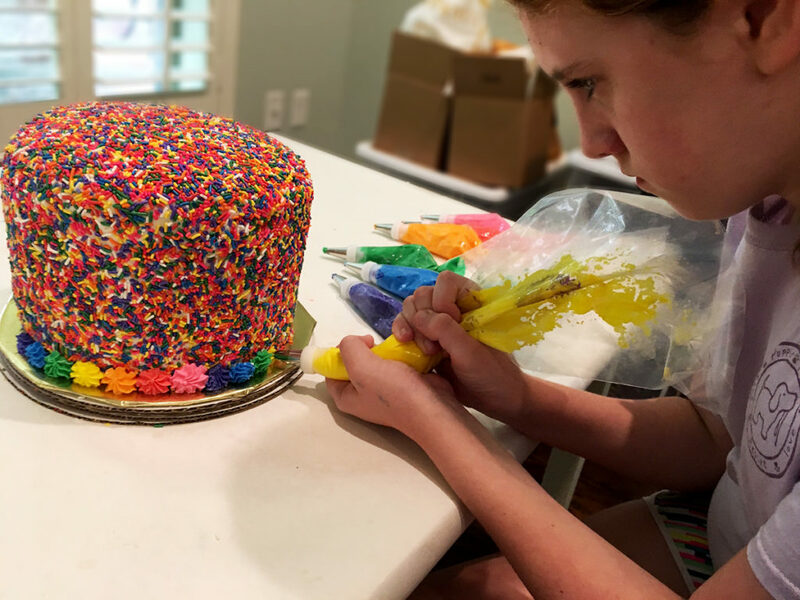 Ava ended up making a seven layer rainbow cake covered with sprinkles and a fondant rainbow topper. 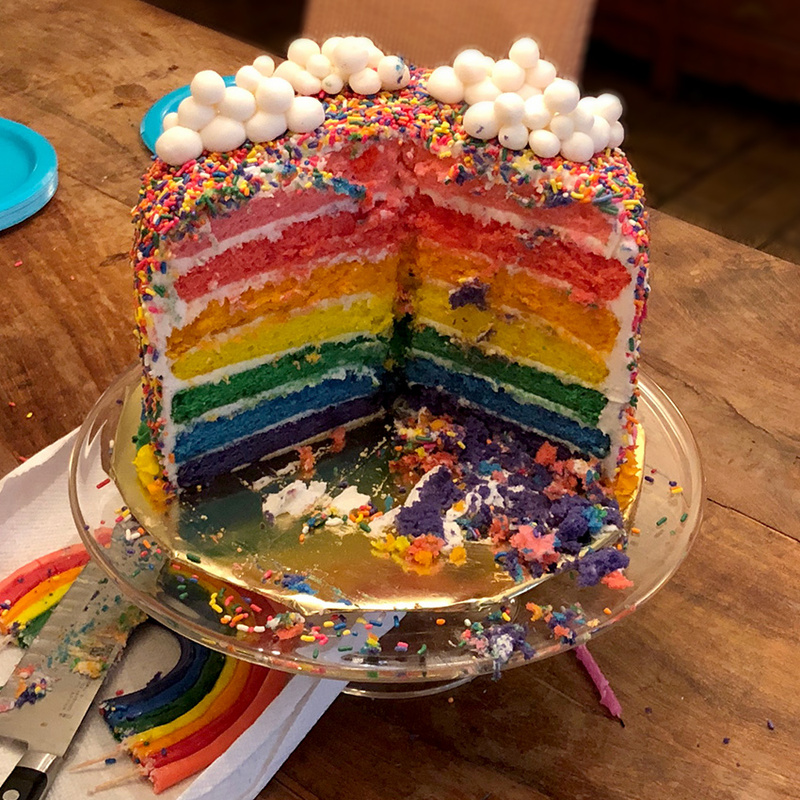 Ava was praised for her cake as being the most beautiful and delicious rainbow cake ever. Of course, Ava stayed humble, smiled and said thank you. While we may make a few messes in the kitchen, it is still such a joyful fun, especially knowing Ava is making leaps in her development in the kitchen. One of our favorite mealtimes is Saturday brunch. It is a time for testing recipes Ava finds in cookbooks, and when our family comes together to eat the amazing food Ava helps to prepare with love. Maybe Ava will host community brunches, have a bake shop, or be a chef in the future. Only time will tell for Ava, our sweet baker and cook.